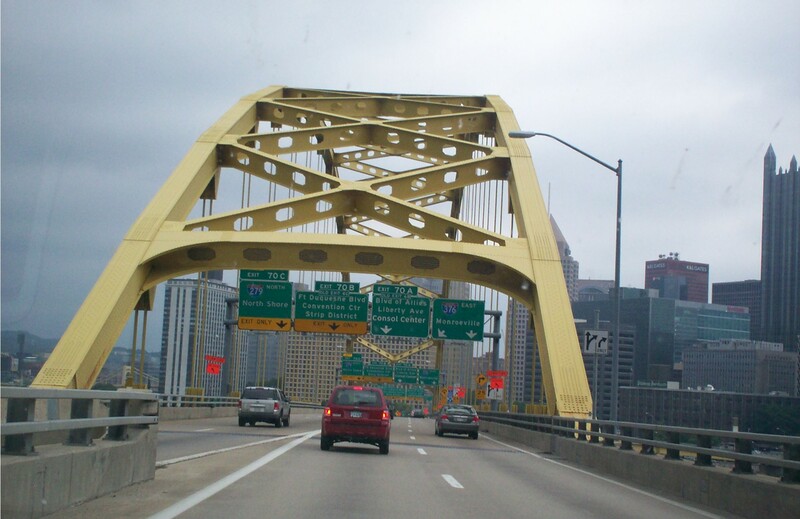 Our 2010 Road Trip, Part 16: The Art of Pittsburgh « Midlife Crisis Crossover! 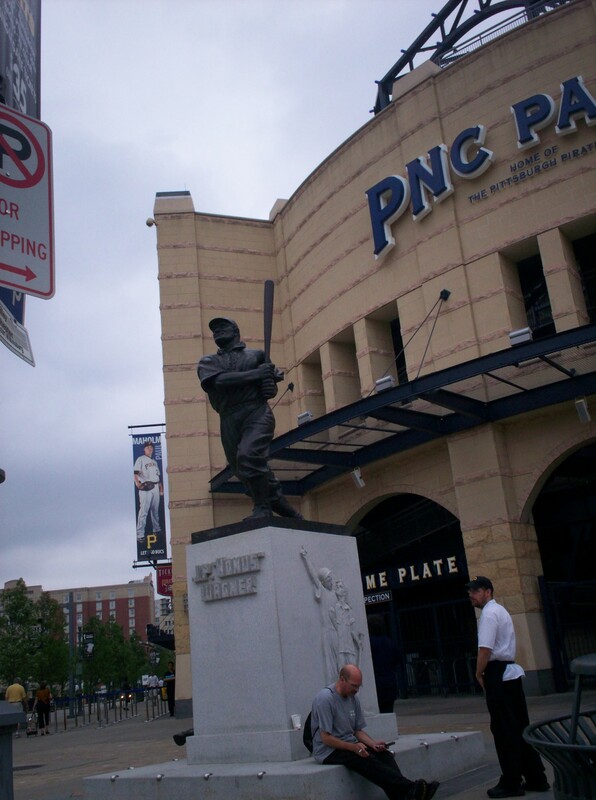 For the sports fans out there: we ran across Pittsburgh Pirates shortstop Honus Wagner in front of PNC Park while searching in vain for a Mister Rogers statue. Not really the same thing. Every vacation has a final day, by which time everyone’s overloading on new memories and experiences, exhausted and ready to return home to the comfort of their own bed, and in dire need of time apart from their travel companions. On our early road trips we came to learn that the final day of our trips felt ten times longer if we didn’t give ourselves something to do on the way back, something to look forward to besides the open road itself. Downtown Pittsburgh had more than enough character for the three of us, even on a deserted Sunday morning. To this day the view of the Ohio River from our Neville Island hotel remains one of the best hotel window views we’ve ever had. I’ve lost count of how many hotels have offered us exclusive up-close looks at the grungy buildings next door. DAY 7: Sunday, July 25th. Despite the fabulous decor, our hotel breakfast looked largely like the last four days’ had, with one welcome addition: fresh sausage links and folded eggs — at last, something not prepackaged and microwaveable. Alas, this prize was not ours alone to hoard. Even with the spacious lobby, all the seats were filled and guests were crammed into the breakfast nook, scrambling and edging and reaching around each other for their share of free food. I refused all microwave options and spoiled myself with some sausage, eggs, and Belgian waffle. Art in roadside architecture: I-376 across the Fort Pitt Bridge, taking us over the Monongahela River and back into Pittsburgh proper. Sightseeing in Pittsburgh on a Sunday morning had its ups and downs. The streets were mostly empty, but their downtown is bent down the middle so that many of the north/south streets don’t quite line up in a row as they should. I’d turn onto one street, head straight, cross Liberty Avenue, wind up on an unrelated street, make only one turn, and find myself passing the original street. I’m glad not as many people were around to watch me do laps around several city blocks while trying to orient myself. Driving and mapping may sound as egregious for inappropriate multi-tasking as driving and texting, driving and drinking, or driving and juggling rabid warthogs, but it’s a habit that’s served me well on every vacation. When that habit fails, my wife’s communication skills are also an invaluable resource, of which I avail myself whenever she takes the opportunity to contribute. Although she so dislikes interrupting my train of thought, the occasional well-placed word of wisdom can be invaluable when it’s needed most, regardless of whether or not I’m in the proper frame of mind to receive and appreciate it. The subsequent discussions can also bear fruit, serving as an open platform to compare dissenting opinions within the boundaries of a strong and understanding marriage. Her: GIVE ME THE MAP! …and then we were fine after that. Our copious pre-vacation notes tried to point us toward a statue of former resident Mister Rogers on the north side of the Allegheny River, near all the local sports stadiums. After twenty minutes of circuitous wandering, we found him facing away from the road on a plot of land next to Heinz Park, where the Pirates were preparing to play the Padres. The cheapest lot I saw within four blocks of our man Fred was charging twelve bucks a carload thanks to the day’s big sporting game activity things. We were in no mood to be any parking attendant’s friend. Instead we had to settle for a quick shot of this homegrown Transformer. My son, never a PBS fan, was pleased with this triumph of steel over sweater. 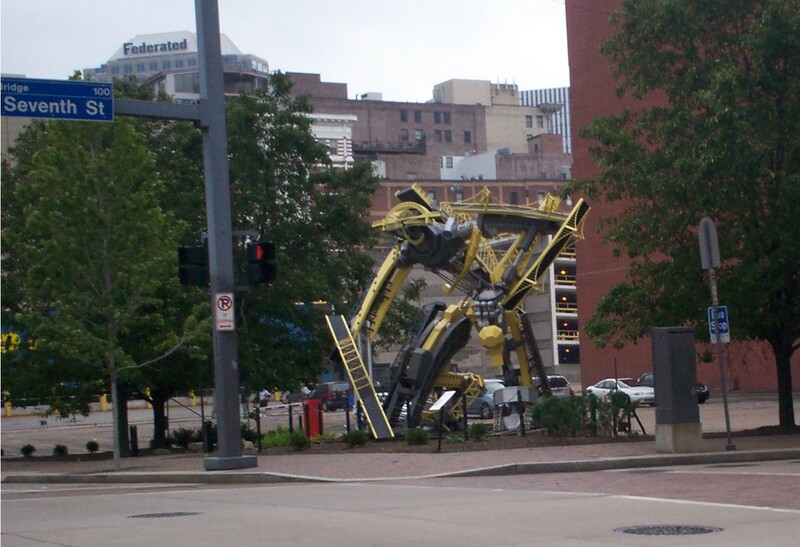 “Arch” by artist Glenn Kaino, made entirely of bridges, was built in 2008 in honor of Pittsburgh’s sestercentennial. 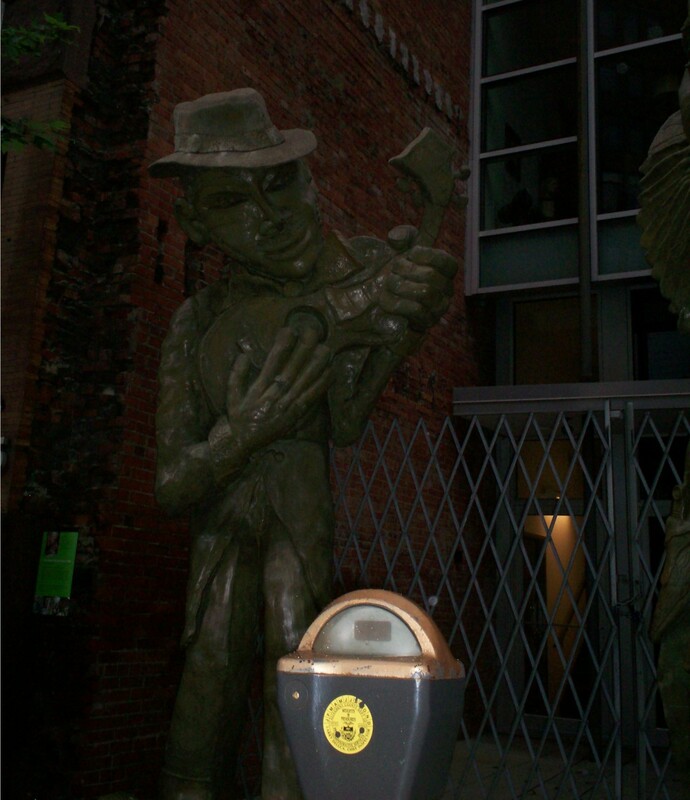 We made our way back to the heart of downtown, where our next stop had jazzman sculptures outside — James Simon’s 2003 trio called “The Liberty Avenue Musicians”. Possibly the leader of the band? Possibly band members bitter that one of their own turned prima donna? These hep cats grooved right next door to the ToonSeum, a modest salute to comic books that felt more like a specialized art gallery than a full-fledged museum. This longtime comics collector was totally fine with that. Thankfully this side of the Allegheny had plenty of free parallel parking and far fewer sports fans competing for our roads and spaces, so we were able to spend a few minutes checking it out. At the time their main exhibit was a tribute to cartoon dogs. Posted for perusing were several pieces of original comic strip art, sketches, and a few comic-book pieces with dogs in them. For a four-dollar admission, it was a pleasant diversion, not really intended or needed to be a fancy Met-sized experience. 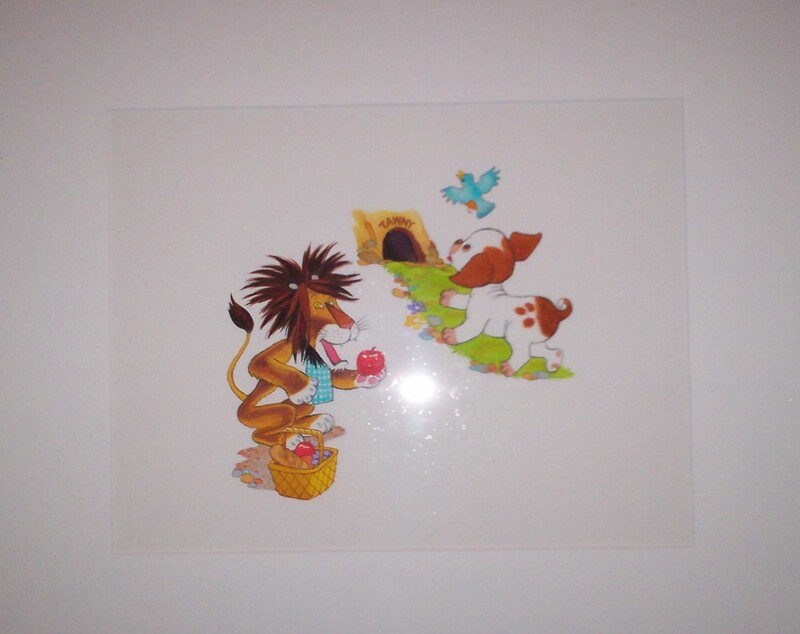 Original art from a pair of classic Little Golden Books, The Poky Little Puppy and Tawny Scrawny Lion. Both were in my toddler reading library. 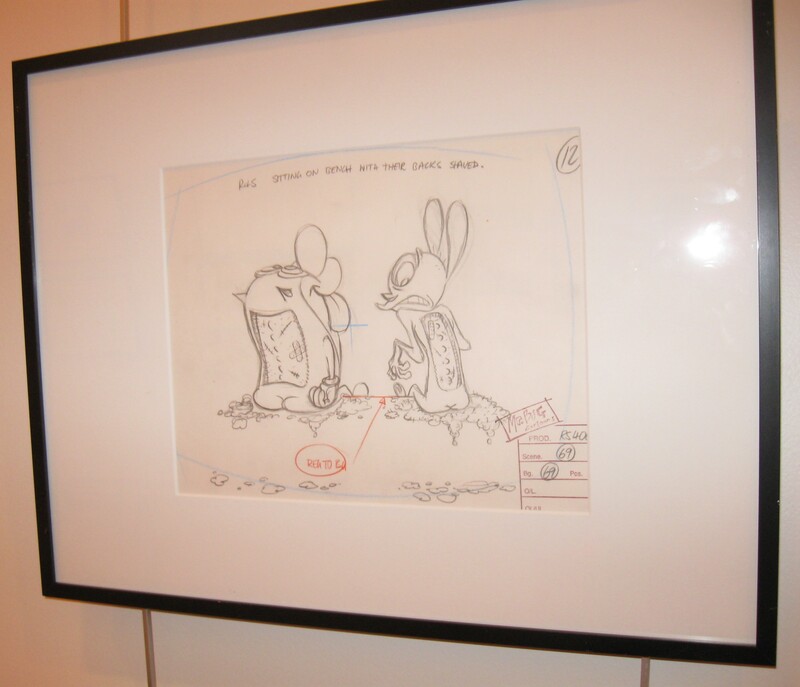 Ren & Stimpy animation sketch. 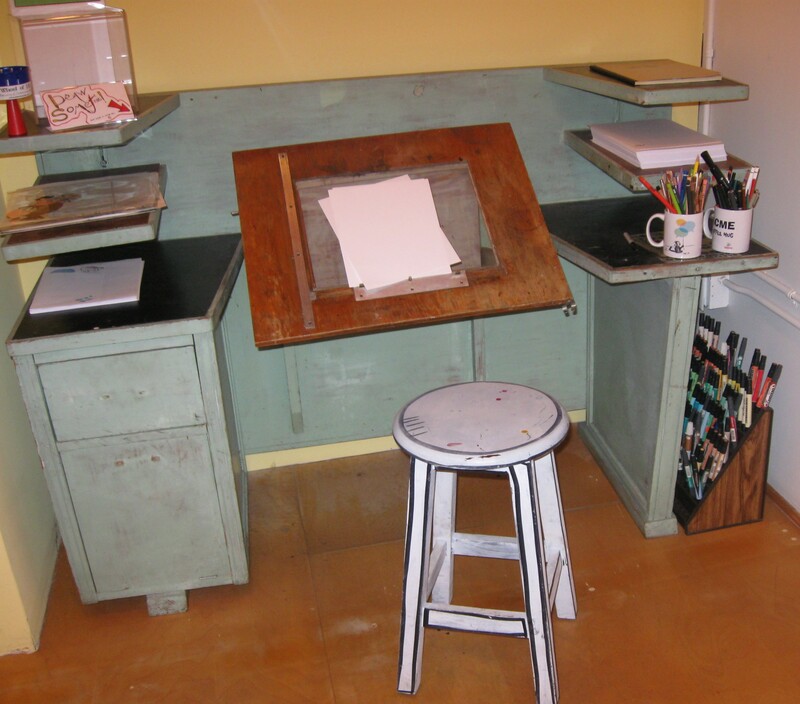 Their most notable permanent exhibit: a genuine Walt Disney Studios desk and chair from ye olden days of animation. My son was more impressed by this folded-paper model of Howl’s Moving Castle that must’ve taken decades to assemble juuust right without leaving mismatched white spots or unattractive clumps of glue. Viewing every available piece took a total of five minutes. I easily spent twice that just browsing their gift shop, which was several bookshelves of the most comprehensive graphic novel collection I’d ever seen outside a true comic shop. I limited myself to a single purchase and allowed my family to pull me out the door. We’d had no firm lunch plans until we looked up from our parallel parking space and realized we were in front of a bona fide Pennsylvania cheesesteak shop. Obviously this was a bit of fudging on our part. There’s a reason they’re called “Philly cheesesteaks” and not “Pittsy cheesesteaks”, but it was too late to do anything about that. Thank the Lord it wasn’t a Subway. The staff at Cory’s Subs was very cordial, very good at their jobs. It helped that we were their only customers. Chalk up another victory for early Sundays downtown. 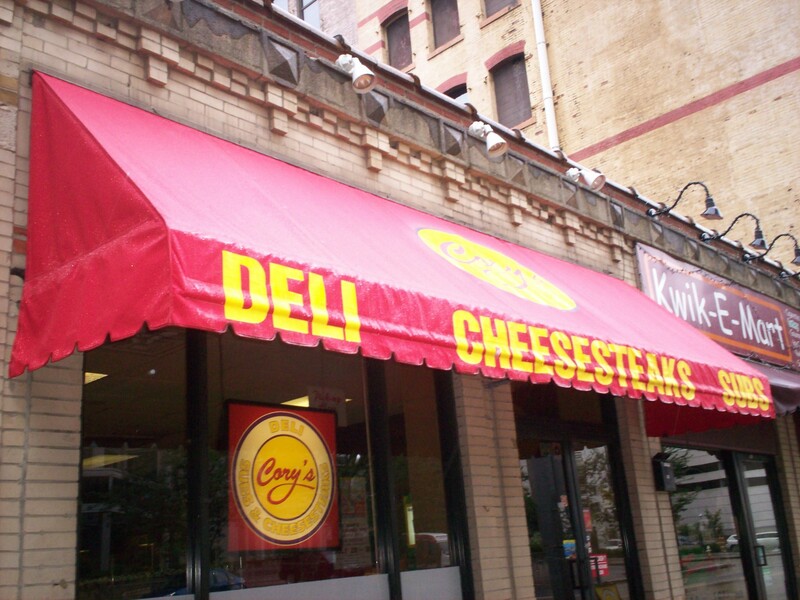 I’m sure famous Geno’s in Philly makes Cory’s look appalling and poisonous by comparison. 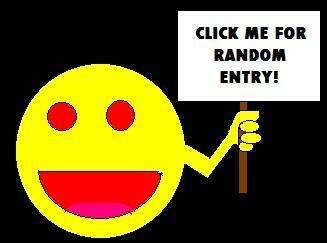 It’s a shame that Geno’s inconvenient location and our poor timing hadn’t work out. We lived with what our circumstances permitted. 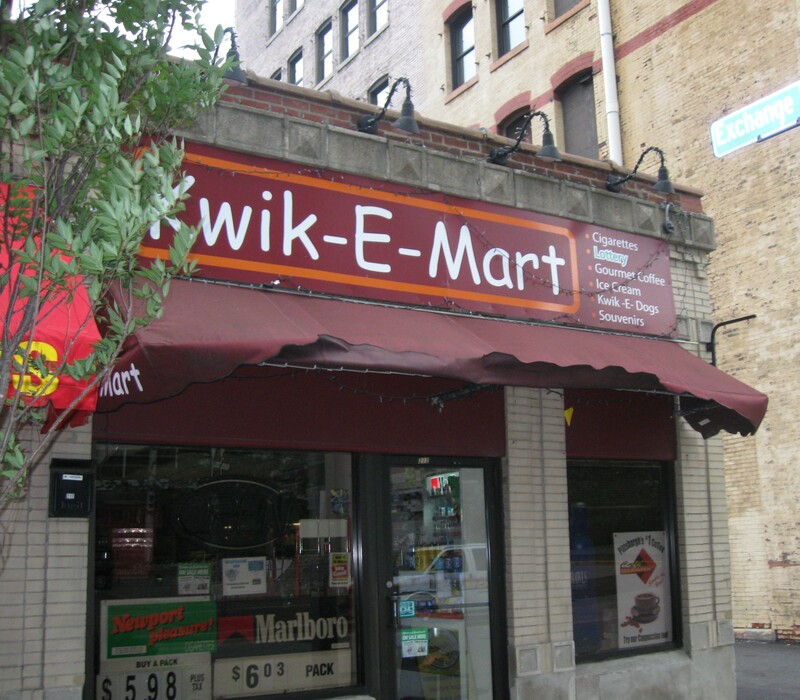 We Simpsons fans couldn’t help notice the Kwik-E-Mart next door. This is why our stop at Cory’s was obviously meant to be. Departing the City of Steel was much simpler to accomplish than reentry had been. 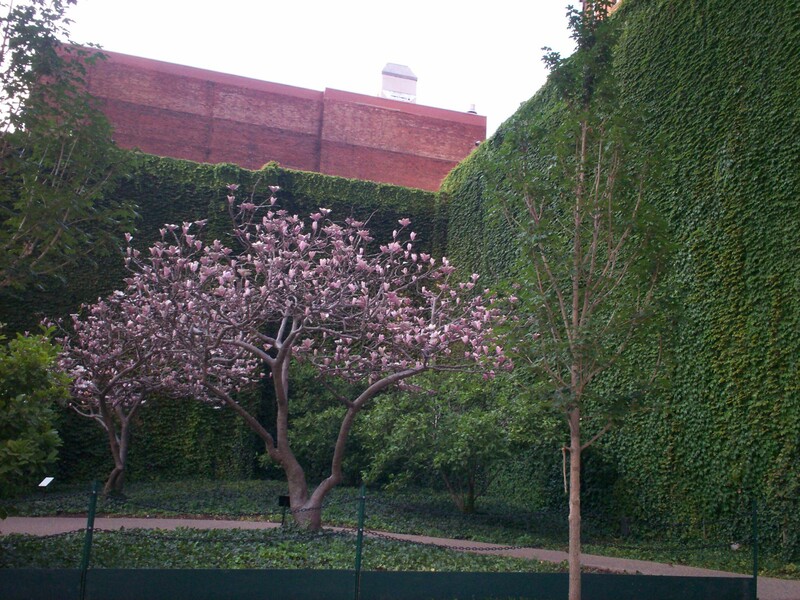 On the way out, Anne was tickled pink to spot a random pretty tree. No park attached, no companion trees, no signs of explanation, just a single bit of purple greenery sprouting for no reason on a corner block scrunched between the cold, concrete works of man. 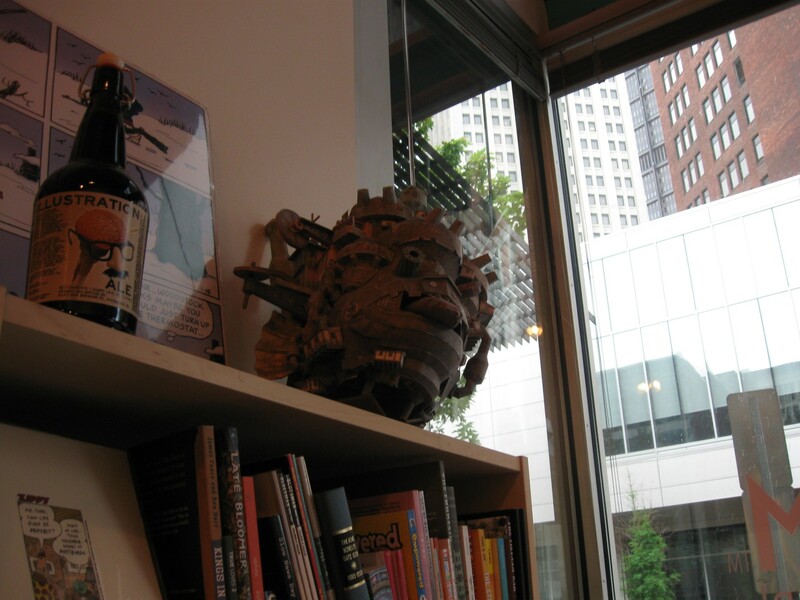 Art comes in a variety of forms and media. 1. 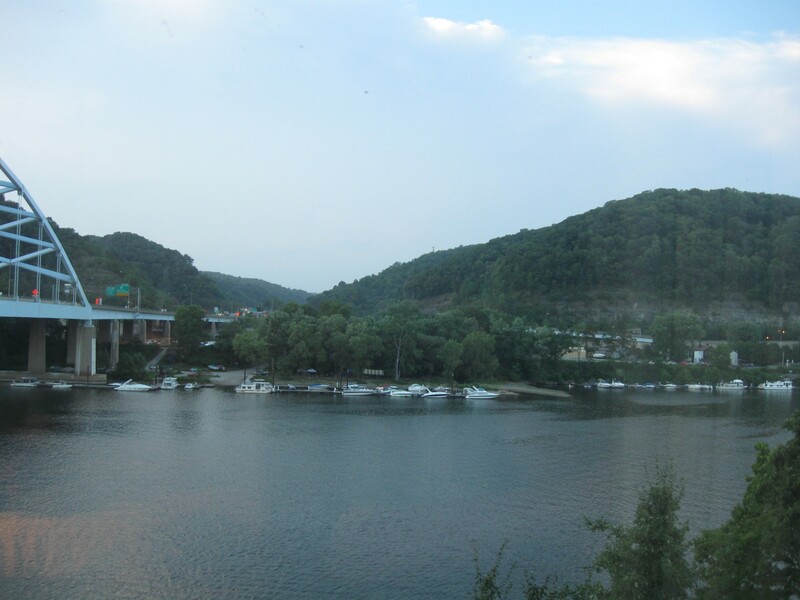 For views of the Monongahela River itself, I direct you to our stop in Morgantown, WV, on our 2017 road trip, as well as our jaunt up Mount Washington later in the same week. 2. “Arch” the Transformer stood on that street corner from 2008 to 2011, removed when repairs were required for his body that was never meant for long-term outdoor exposure. 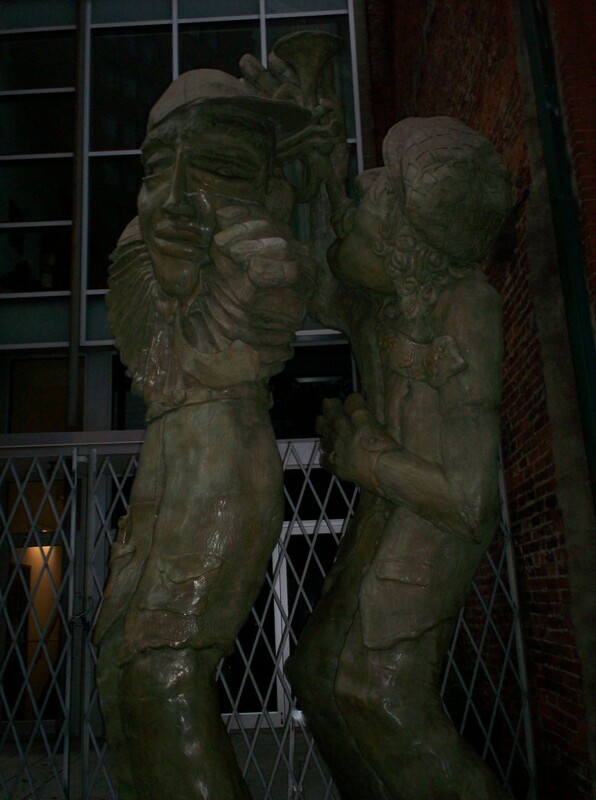 In 2013 “Arch” returned to the public eye as a permanent fixture at Pittsburgh International Airport. 3. Longtime readers may recall our years-in-the-making “Former Kickstarter Junkie” series that concluded earlier this year. Fun trivia: my very first Kickstarter pledge was for a ToonSeum expansion campaign. Their pledge drive was successful, but I never had the chance to see the results in person…and now I never will. I was saddened to hear the organization, while still an existent thing in itself, closed their physical location in February 2018 when their lease expired. Here’s hoping they find new life in better digs. Thank you for sharing your story and these beautiful images! My pleasure, and thank you!